Israel has launched more air strikes against the Gaza Strip, at sites it said were linked to militant groups. 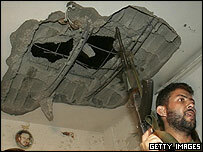 Missiles struck buildings in Gaza City, knocking out power nearby, and in a refugee camp in central Gaza. Artillery was also used for the first time. The continued barrage, which started at the weekend, comes a fortnight after Israel withdrew from the Gaza Strip. Talks between Israeli Prime Minister Ariel Sharon and Palestinian leader Mahmoud Abbas have been postponed. Palestinian negotiator Saeb Erekat said the meeting would not take place as planned on 2 October, "but only once the preparations for this summit have been completed". "We don't want to meet just for the sake of meeting. We want a well-prepared meeting with an extensive agenda focusing on all the current issues," Mr Erekat said. The series of Israeli offensives against Palestinian militants was triggered last week when rockets were fired into Israel from Gaza. A BBC correspondent says Israel is keen to show there will be a sustained response if it comes under fire. Dr Sabri Saidam, Palestinian minister for Telecommunications, said the raids were "totally out of proportion... out of reason". "I see that Israel is using neither sense nor any proper judgement in its attacks," he said. The strikes occurred despite the militant group Islamic Jihad joining Hamas in saying it would observe a truce if Israel stopped its attacks. The militants say they reserve the right to hit back if Israel continues to target them. Hamas said last week's attacks were retaliation for an explosion at one of its rallies that killed 16 people on Friday. Israel denies involvement. The group earlier released a video of an Israeli businessman found dead after being abducted last week. It accused Sasson Nuriel of being an agent with Israel's intelligence agency, Shin Beth. In the video he was shown sitting blindfolded under the Hamas banner. In the latest Israeli attacks, occurring just after midnight local time, a youth centre and an office linked to Palestinian President Mahmoud Abbas' movement Fatah were hit in Gaza City. An Israeli aircraft destroyed a bridge in Beit Hanoun, in the northern Gaza Strip, which the Israeli army claims was being used by Palestinians for their rocket attacks. An Israeli spokesman said that each of the buildings targeted was somehow linked to "terror activity". And in a pre-dawn operation in the West Bank, Israeli troops raided offices belonging to Hamas and Islamic Jihad. No injuries were reported in any of the strikes. The BBC's Alan Johnston in Gaza says for people in Gaza, as disturbing as anything in the current Israeli campaign are the low-level passes made by fighter jets. When they break the sound barrier there is a sudden deafening, frightening explosion that seems to shake every building, he says.